In our day to day suburban life, we occasionally become lost in the endless rotation of chicken, cow, and pig. We know what to expect from our favorite pieces of meat and we have gotten good at turning them into something delicious. However, there is nothing more exciting than branching out once in a while and giving your family or close friends something special, something unexpected. This package contains four four ounce Elk Medallions and four four ounce Venison Medallions. Each piece comes trimmed and ready for your own wonderful manipulations. Experiment with your favorite dry rub or meaty marinades and grill or broil your steaks to perfection. 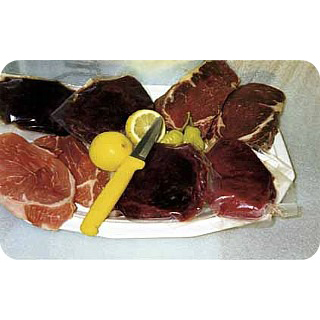 The House of Game takes extra care in making sure that the product you get is one that has never left a state of utmost quality; from the time the animal is butchered to the time it reaches your door, it has been handled in a way that does the best job of maintaining its superior taste and texture.